Colt! You are such a big boy! 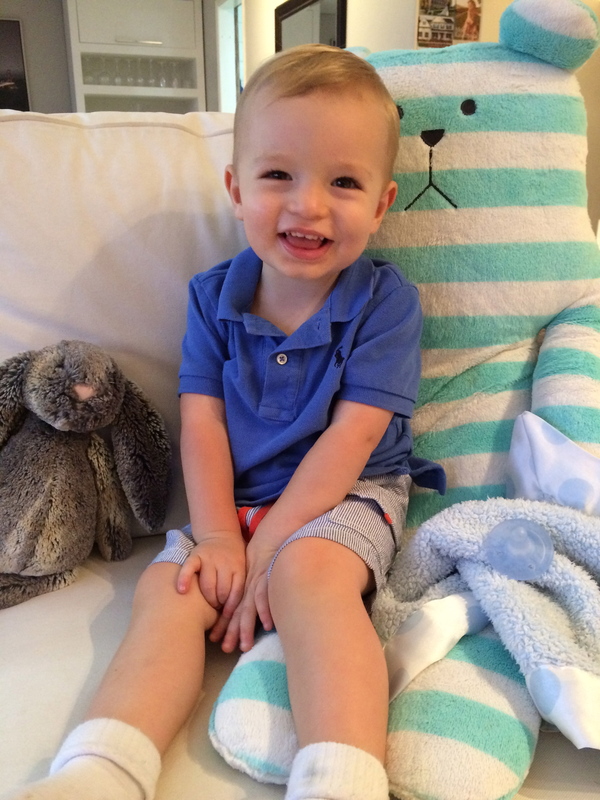 20.5 months old – getting too close to 2!! Colt with Bunny & Wink. – Your favorite toy is a ball and you would seriously be happy kicking balls around all day long. You’re honestly really good with them and have an impressive kick, drop-kick, and you’ve recently learned the “header” where you drop the ball right by your head and knock it down with your forehead. You also have a little t-ball set-up and you love playing with that as well, but you normally hit the tee instead of the ball. – You have also gotten really into legos (well, Duplos really) over the past couple months. We have the teepee set up for you and we keep your legos in there and you will grab my hand at least once or twice a day and pull me there saying “peetee, ego.” Sometimes you’re really good at building things and other times you get very frustrated if you can’t quite get them to fit how you want them to. – You pretty much always bring your big stuffed toy “Wink” into your teepee and you’ve also become really attached to your stuffed bunny rabbit lately as well. Most animals have names but for some reason, for your stuffed rabbit and anytime you see pictures of rabbits you just stick your tongue in and out over and over a few times. I have no idea where this came from – my only thought is that in one book there is a picture of a bunny eating lettuce and it says “Nibble nibble” and possibly somehow it came from that? I don’t know but it’s really cute and really funny. Just in the past week you’ve gotten more into getting out all of your stuffed animals and lining them up, calling them by name and snuggling with them too. – You are talking up a storm and are definitely bilingual. Around 25% of your words are in Portuguese and 75% English. Some words you’ll start saying in English and switch to Portuguese, but you still understand the meaning in either language. i.e. you first learned “bread” then switched to “pão” but if I ask you where the bread is you can find it and if I ask you if you want bread you’ll say “pão peese (please).” You also started out with “shoes” then switched to “shoepatos” and now fully to “zapatos.” But if I ask you to get your shoes you will still go get them. For some words it depends on who you are talking to. With me, you always call ducks “ducks” but with Portuguese speakers you call them “patos.” You also definitely understand a ton in both languages as you will obey commands in either language. It’s fascinating to watch and I think it’s very cool. – You love letters!! You have an alphabet mat in your room and love to point to letters and practice saying them. You have an alphabet scripture book too that you love to read because you will find the letter on the floor as we are reading. You can find and say all on your own B, D, E, F, O, P, Q, R and W. And when asked, you can identify a few others too and you love to repeat the sounds. You also really like counting in both English and Portuguese (you can more or less count to 3 in English and 6 in Portuguese). In both languages, your favorite number to say is 2. But you love it when we count for something – even just before you kick a ball. – You do funny little things every day which surprise me and make me laugh. Just today I was cutting your nails and when we finished you took the clippers and went to your stuffed animals and pretended to cut theirs as well even though they clearly just have little stuffed hands and feet – no semblance of nails at all. – Although you are very expressive and talkative with me, you sometimes seem quite shy around others. It depends – sometimes you will wave to every person you see and call “bye bye” to them as you pass by, even blowing kisses – but other times, especially if I am talking to someone new, you will hide behind my legs and hold tightly to my hand. You’ve only done this a few times but it always strikes me – like, where did you even learn to do that?! And why? – Your personality has remained very consistent from birth as you continue to be a calm, easy going guy, pretty cautious and very observant. In big play groups you often sit back and just watch quietly for a while before finding something you want to do. – You give the sweetest snuggles, hugs and kisses in the world. I love how you get a little turtle-face when you’re puckering up for a kiss. Melt my heart. – You are excellent at sharing and play very well around other kids. I volunteer in the nursery at our church and am always impressed with how you behave in that environment of a pretty small room with a bunch of toddlers running around. – It’s not all giggles all the time though. You struggle with “independent play” and REALLY want someone to be engaged with you or at minimum sitting with you almost all the time. A small amount of each day you will busy yourself kicking balls, reading, playing with legos etc. on your own but it’s usually short lived before you come running to me, grabbing my hand saying, “Mama peese. Mama peese.” It’s hard to resist the sweetness and innocence of the request but it’s a little exhausting sometimes. If I sit down at my computer you immediately get upset and try to move me away because you know my attention won’t FULLY be on you – even if you’re basically playing right at my feet and I’m still talking to you! Some of my friends have said they think that you can sense I’m pregnant and want more attention but I also think it could just be the age. Kind of wears me out some days though. – You are also in the stage of frustration-fits where you will panic and body flail at RANDOM if something totally insignificant doesn’t go how you were hoping. Sometimes it’s legos. Sometimes it’s that I was laying down flat on the floor and now I want to have a pillow. Sometimes it’s that I moved your tee-ball set 1 inch. It’s rarely a contest over something we’ve asked you to do but instead just a random freak out. I either ignore it so as not to incentivize such behavior OR I try to get you to zero in on saying a word which stops you from crying and helps enforce that we solve frustrations with communication. Who knows though. I think it’s also just the age and it’s not something I’m loosing sleep over. – You adore your daddy and get so excited when he comes home at the end of each day and love to wrestle around and do boy things with him. You are blessed with a truly excellent father who models well for you the love that your Heavenly Father has for you. Colt you are a TOTAL JOY and bring light to our lives every day. You are our treasure and your dad and I cherish the blessing that it is to parent you. Health: We continue to thank God for your health. To this point you have never really gotten sick or had to go on antibiotics. The most you’ve ever had have been a few little colds here or there, fussiness related to teething, and a 24 hour stomach bug once. You definitely get banged up though and your legs are constantly covered with scrapes and bruises but it doesn’t slow you down at all. You’re still in size 4 diapers and continue to basically be right on track with clothing sizes. At your last appointment you measured in the 75th% for height and 62nd% for weight. Healthy boy! Your hair is finally growing and it is like the finest, softest, silkiest gold. Your eyes continue to confuse me, looking different all the time. I guess I would classify them as hazel although they are a very deep hazel with browns, grays and hints of green whereas your dad has much lighter, more honey colored hazel eyes. One thing is for sure – they are heartbreaker eyes. Eating: You’re a good eater sweet one but not the easiest in the world. You are a little picky, very hesitant about trying new things and are generally resistant to strong flavors or large chunks of veggies or meat in a dish. Like, you would never just bite into a big piece of broccoli or even a strawberry. You do better with shredded chicken, cooked spinach, mashed up broccoli, peas, peppers if they’re pretty cooked down, etc. (Putting chicken and veggies in the slow cooker has been good for us in this respect.) However, foods you love and will always eat include corn, pasta, fried rice (even with chunks of meat, eggs and veggies! ), yogurt (your FAV), cottage cheese (or any cheese for that matter), smoked fish, crackers or snacks. Sometimes you will love a food one day and refuse it the next. Scrambled eggs/omelets, quesadillas and grits are always a gamble. We aren’t big on snacks but once or twice a week you’ll get a couple of crackers, cheerios or a very plain version of a cookie but we don’t give you things like real sweets. I have actually been craving chocolate pudding lately and whenever I eat it you refuse to get near it! Ha. Your eating schedule is: Milk when you wake up (5-6 oz), breakfast of a banana mashed with oats and yogurt or oats and a homemade fruit/veggie sauce then lunch and dinner meals that include meat, veggies and starch. You also take 7oz of milk when you wake up from your nap (so that kind of serves as your afternoon snack) and otherwise you stick to water. We will give you juice during meals once or twice a week but you honestly prefer water and so do I. Better for your teeth and less mess if it gets anywhere. We hold hands and pray before each meal. Your dad and I always close each prayer with, “in Jesus’ name, Amen” and as you hear us starting that phrase, you love to join in with “Amen.” The funny thing is that you totally demand that everyone who is in the house at that moment be involved in the prayer. If your dad is home but not in the room with us you hold your hands up and say “Dada amen, Dada amen” until he joins. You do this with any guests we have over too and just want everyone involved. I love it. You can feed yourself pretty well and I’m trying to let you do it more and more but if it’s going to be particularly messy or I’m trying to get you to eat something you’re not a huge fan of then I still feed you myself. This is fine but you have to be distracted to allow it so you generally read books or play with your play food during this time. Sleeping: Aside from that one weird week that I wrote about a couple posts back, you are an awesome sleeper. You are always happy to go down for naps or at night and you basically never wake up until it’s time to get up. Sometimes you’ll wake up a little earlier than normal but usually if I let you cry for a few minutes you’ll go back down until a reasonable hour. Naps can vary a little in length depending on how you’re feeling, but you always do at least an hour/hour and a half and sometimes up to 3 hours. Your bedtime routine is not very involved – we never wanted to get sucked into a long, drawn out process and also didn’t want you too tied to a big routine since we are often traveling or want to put you down at a friends’ house or with a sitter. Basically we clean up any toys you have out or any messes you’ve made (pulling things off shelves in the kitchen), change your diaper and your clothes, brush your teeth (I feel like we are FINALLY making some progress in this department although the effort is still pretty pathetic – you just don’t like it! ), we read one or two bedtime books then put you in the crib, pray for you and walk out. You pretty much have to sleep with your sound machine on (also lets us feel like we don’t have to tiptoe around the apartment while you’re sleeping) a pacifier, your blankie and your water bottle. You have an elephant pacifier in there too but basically just hold onto it sometimes – you don’t really use it. You would love to walk around all day with your paci and blankie but I don’t think that’s best (especially for verbal development) so whenever you get up you have to throw them back in the crib and you say, “Bye bye paci. Bye bye blankie.” I have to move them to the back middle of the crib though or else you’d grab them back out 5 minutes later. But if they’re out of reach you’re fine. Mama: I’m enjoying this stage that you are in SO much Little Colt! You are turning into such a real person, a real little friend and playmate with new thoughts, ideas, words and actions every day, yet you’re still such a sweet and innocent baby. My baby. I am cherishing these days with you as our only and I can’t believe that I have been blessed with the privilege of being your mom. « Pregnancy #2 – So far. What a wonderful update. Hope to see you real soon!